Mopti, the "Venice of Mali", is situated on the Niger river, near the town of Djenné with its famous mosque and archaeological sites. 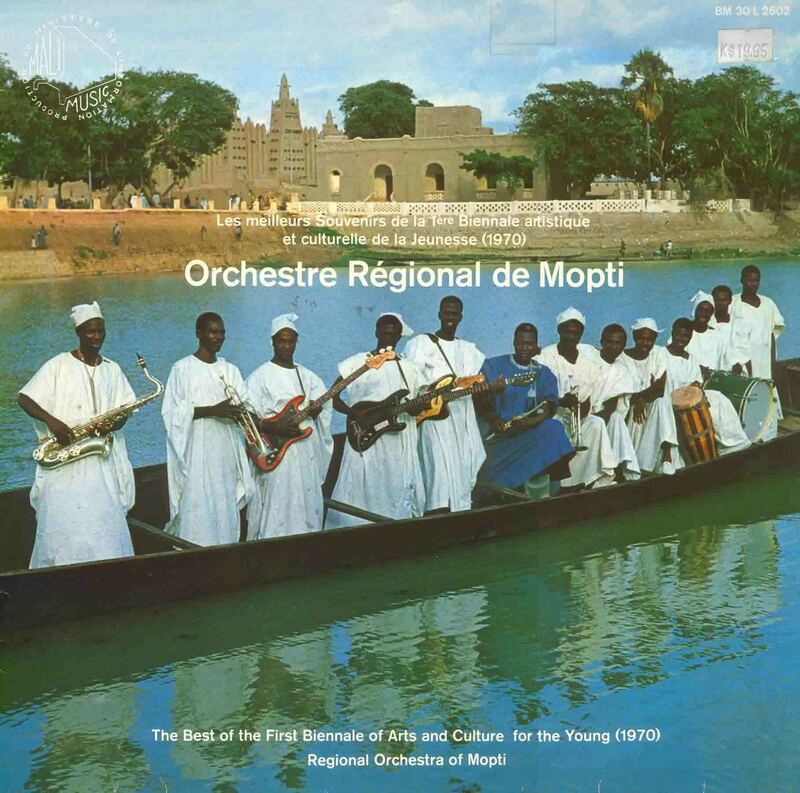 As a regional capital, Mopti maintained its own state-funded orchestra, and at Mali's national arts festivals the Orchestre Régional de Mopti performed against other regional orchestras in competition. Mali's arts festivals were held in Bamako from 1962 until 1988, when internal unrest and budgetary constraints forced their closure. In 2001 they were resurrected and are now held every two years. The Orchestre Régional de Mopti produced two recordings - a 10" disc of four tracks released through the national radio station and one album through the Bärenreiter-Musicaphon label in circa 1970. Some of the orchestra's members, however, also performed in Kanaga de Mopti, a non-governemt sponsored group, who released a LP on the Mali Kunkan label (see links to Malian vinyl discography and Mali Kunkan discography below). An orchestra of 14 musicians, the Orchestre Régional de Mopti personified the cultural policies of the era by adapting traditional melodies and songs (such as the epic "Taara") into a modern performance context (electric instrumentation, brass section, etc). The Bärenreiter-Musicaphon recordings of Mali's music in the early 1970s totalled over 15 albums, most of which have been unavailable for many years and are now highly sought after. Definite candidates for re-release.